Quality Control | Quality | MURATEC,MURATA MACHINERY, LTD.
"Advanced manufacturing technology and information systems realize high quality product." Muratec's origin is to produce the machine. We have been accepting cutting-edge technology with accumulating know-how in actual production site technology. We believe, however, the "quality" that satisfies the customer includes not only performance as hardware but also other aspects like price, service and timing. In order to provide that total "quality", the advanced information systems, such as flexible and efficient production lines, its control and various data-base, are essential as well as basic production technology. We also pay attention to state-of-the-art technology and marketing trends so that we can grasp customers' needs and advise them properly. Muratec makes every effort to provide real "quality" for the best customers' satisfaction. "We are providing advanced engineering technology based on our experiences at Muratec." Pursuing quality, we reached the concept of one FMS for each production site. 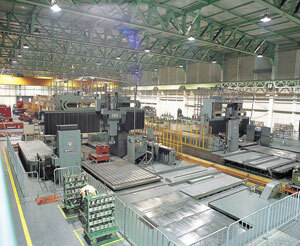 In 1981, the first FMS "NC Center" was established in the Inuyama plant. We continue to establish FMS for various processes. As a result,we succeeded in realizing multiple production lines for small lots according to quality requirements. FMS has evolved the new concept of CIM (Computer Integrated Manufacturing), supported by the development of computer technology during this period. Muratec has incorporated its rich know-how into products as a manufacturer of production materials and resources. We have been providing advanced engineering technology both in hardware and software to the sites for various products.